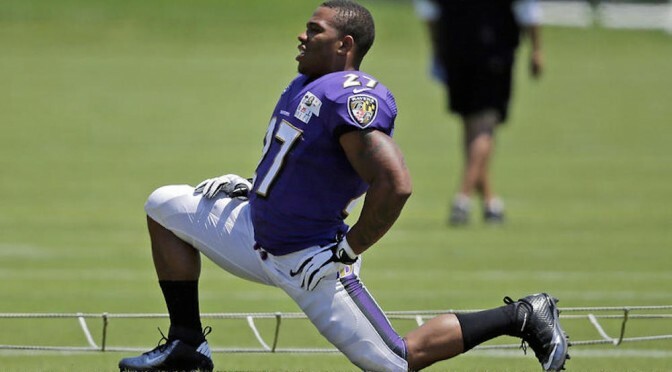 The NFL’s lax two-game suspension of Baltimore Ravens running back Ray Rice incited outrage across the country and demands that the league crack down on players who commit misdemeanors. “You wonder what kind of message is sent when pot smokers get longer suspensions than people who engage in domestic violence,” Bob Kravits of the Indianapolis Star wrote in an editorial about the incident. Rice allegedly punched his then-fiancèe Janay Palmer during a fight in February while inside an Atlantic City elevator. This comes shortly after the season-long suspensions of Josh Gordon of the Cleveland Browns, LaVon Brazill of the Indianapolis Colts and Cardinals’ Daryl Washington for violating the league’s substance abuse policy. All three tested positive for pot. Fans are wondering why a hit to your significant other’s face is more justifiable than a hit of marijuana. Others have argued that the suspension of Rice without a suspension of Colts owner Jim Irsay shows favorable treatment of the higher-ups who sign the checks. Irsay was arrested in March and charged with driving under the influence and possession of a controlled substance. While these instances have most frequently been held up against the Rice suspension, I wondered what other crimes the NFL finds more severe than assault. In 2006, Odell Thurman of the Cincinnati Bengals was suspended for four games, twice as long as Rice, after failing to appear at a scheduled drug test. Just a couple months later, Thurman was arrested for a DUI and missed the entire 2006 and 2007 seasons. Vincent Jackson pleaded guilty in February 2010 to driving under the influence and was suspended from the San Diego Chargers for three games. Houstan Texan Antonio Smith was suspended in August of last year for just one game less than Rice after swinging around the helmet of an opposing player. So, by that logic, swinging around two helmets is pretty much the same thing as knocking your fiancée out cold. Steelers quarterback Ben Roethlisberger was suspended for six games (which was later reduced to a four-game sentence) after prosecutors decided to not even charge him in a sexual assault investigation. And who can forget when Plaxico Burress accidentally shot himself in the leg, earning himself a four-game ban? Looking back, it is clear that when Roger Goodell became commissioner in 2006, he demanded that the league stop being so lenient about players performing violent hits, but something still had to be done about some players’ unacceptable off-the-field behavior. In April 2007, Goodell introduced a new Personal Conduct Policy following a year of significant scandal surrounding some players’ actions off the field. But after this recent suspension, I’m not sure if Goodell has cracked down hard enough. Several members of the United States Senate agree. “The decision to suspend Mr. Rice for a mere two games sends the inescapable message that the NFL does not take domestic or intimate-partner violence with the seriousness they deserve,” Sen. Richard Blumenthal, Sen, Tammy Baldwin and Sen. Chris Murphy wrote in the letter to Goodell and Ravens general manager Ozzie Newsome. When Rice puts on his uniform, he accepts a position as not only a running back for the Ravens, but also as a role model for individuals across the country. Rice should be ashamed of his actions, and the NFL should be ashamed of the meager slap-on-the-wrist that he received. Tags: domestic violence, nfl, ray rice, roger goodell, suspension. Bookmark the permalink.